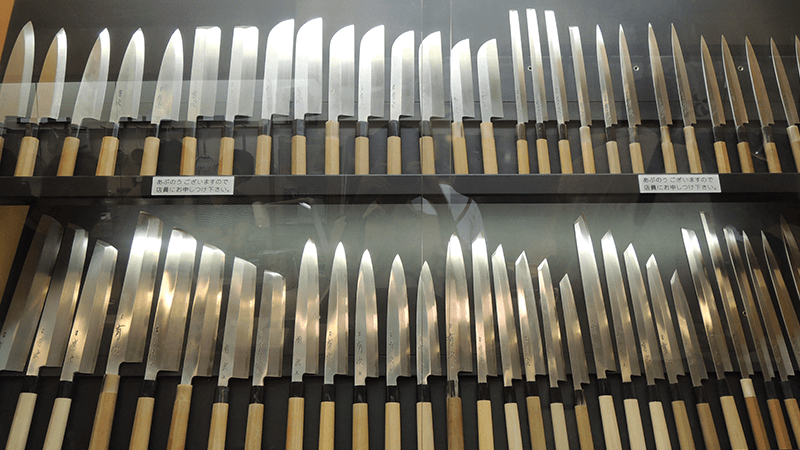 Aritsugu is a store specializing in knives and cooking utensils, located in Nishiki Market, one of the most popular markets among tourists. The sharpness and usability of Aritsugu knives has been certified by chefs from Japan and all over the world. In addition, Aritsugu also offers some fascinating items designed for the family home, including all-purpose knives and saucepans, frying pans, tea strainers, and more. All members of staff can speak English, so this store is well known for its large number of overseas customers. Aritsugu's products are sure to make cooking much more fun. The majority of overseas customers visiting the store are drawn to these knives. Prices vary depending on their use and size. We recommend the Japanese Santoku Knife for home use, ideal for cutting a wide variety of ingredients including meat, fish and vegetables. As they are made of stainless steel, their maintenance is also very easy. A wide range of shape cutters to create flowers, animals, stars, and more. Ideal for cutting out vegetables or making cookies. Just watching them gives you a great sense of fun! Tea strainers made of copper. They are sure to make your tea time much more fun. Also available as a set with a tea strainer cup. Cups for drinking Japanese sake. Made with copper, and they even look cool as well! Buying some sake at Nishiki Market and then going back to the hotel for a drink is a chic way to relax. The knives are shown from within a display case, so customers are unable to feel them in their hands. If you explain to a member of staff what type of knife you are interested in and for what purpose, they will bring out a selection recommended for your needs. However, customers can feel free to touch other kitchen accessories. We can engrave customers’ names on knives. The staff would also be very pleased to provide information on how to look after them. Knives cannot be carried into the cabin when travelling by plane. Please store them in a suitcase and pass them to the airline as checked-in baggage. English-speaking staff, English leaflets, French leaflets.